Apologies that Wednesday Happy Hour and Supper Club has not posted yet. As I mentioned, last week Dante Stephenson, owner of Dante’s Down the Hatch, gave me a tour of some of this favorite artifacts which decorate the one-of-a-kind interior of his classic Atlanta restaurant. To be honest, there’s so much great material and photos that I just want to get it right, so bear with me. The piece may post this week or I may hold it until next Wednesday. In the meantime, without further ado, here are some ATLRetro picks for this weekend. 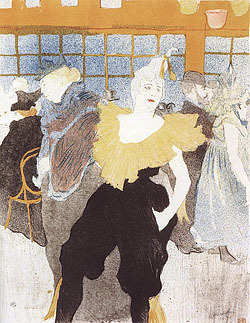 OK, Henri de Toulouse-Lautrec died in 1901, but it’s not a stretch to say that his vibrant posters and prints of showgirls, nightclub stars and the café culture influenced the 20th century romantic view of Paris and still inspire today’s burlesque performers. Look for an ATLRetro review/preview soon of the High Museum of Art’s dynamic new exhibition, TOULOUSE-LAUTREC AND FRIENDS: THE IRENE AND HOWARD STEIN COLLECTION, which opened last Saturday and runs through May 1. After night falls, catch Ghost Riders Car Club at Pho Truc in Clarkston celebrating Vietnamese New Year every Thursday in February with classic ’50s honkytonk and rockabilly. Don’t miss this week’s KOOL KAT OF THE WEEK with guitarist Spike Fullerton. Also, the Breeze Kings bring the blues to Northside Tavern. Or listen to Tongo Hiti’s luxurious live lounge sounds, as well as some trippy takes on iconic pop songs, just about every Thursday night at Trader Vic’s, as well as some trippy takes on iconic pop songs.